Welcome to Blue Star Empire, a well-known bulk supplier of holiday themed socks at reasonable prices. 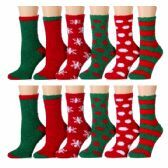 We know the importance of festivals like Christmas that is why we have brought this wholesale collection of Christmas socks at affordable prices. Before your customers plan a holiday this Christmas, make sure you provide them with this colorful range of Christmas socks. You can make your customers' holiday extra special by offering them an awesome range of Christmas socks at lowest prices. This amazing collection of holiday themed socks is available in different sizes like knee length, ankle length and normal length. These pleasing and vibrant range of socks will definitely help you attract new customers this holiday season. These holiday themed socks are very soft, comfortable and warm. If you want to present a great treat for your customers this festive season, then this collection of Christmas socks is a must have for your store. Go through the page to find Christmas socks according to the needs and preferences of your customers. Greet your customers this festive season with an exclusive range of holiday themed socks provided by Blue Star Empire at exceptionally low prices. 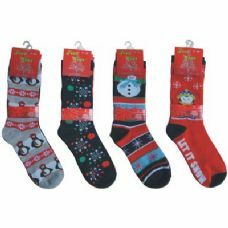 The collection provided by us include a variety of socks such as Christmas knee high socks, Halloween socks, ladies Christmas socks, printed socks, valentine printed socks and many others. We can assure you that these beautiful socks will win the heart of your customers by their soft fabric and charming look. These socks can be worn by adults, youngsters as well as kids. Blue Star Empire is a popular name in the wholesale market for providing products of superior quality at discounted prices. If you think that low prices means low quality, then you can't be more wrong. We can assure you that your customers will have no reason to complain when it comes to the quality and longevity of the material used. Shop for these fuzzy and soft Christmas socks in bulk for making shopping the best experience ever for your customers. You can help your customers celebrate Christmas in style by offering them this super astounding collection. If you are looking to upgrade your store's inventory with a special collection, then Blue Star Empire is the right choice for you. It won't be wise to miss out on a collection that comes with such low prices. We can assure you that your customers will never go empty handed if you have Blue Star Empire's latest collection in your stock. Don't waste a minute more and place your bulk order right away. For more information regarding our products, you can contact our client service team.